"THE 'Spray' WILL COME BACK." Illustrations are given inline in the text as in the printed original. If you wish to copy the picture files to your local disk, they are located in the "img" subdirectory of this directory. When viewed inline with a white background, the blue images render reasonably well, but when displayed on a background other than white, the colors are distorted. We suggest you view the blue images inline in the text and with a white background if you reuse them. 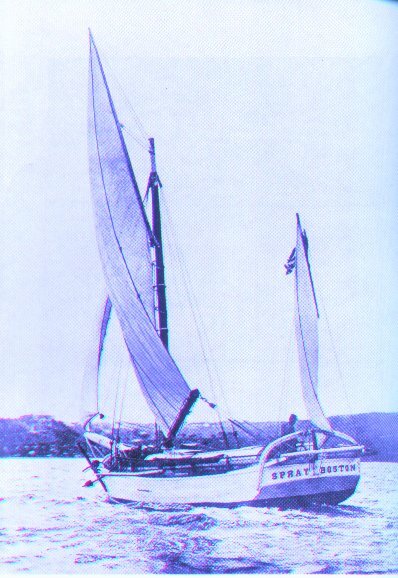 The "Spray" --Frontispiece --From a photograph taken in Australian waters. The "Spray" passed by the "Oregon"
We follow for copytext the Dover Publications edition first published in 1956, (ISBN 0-486-20326-3, LCC 59-7670), an unabridged reprint of the 1900 first edition. We omit Dover's copyrighted introduction by Geoffrey Mott-Smith. You may obtain a printed copy of the book from your local public library or bookstore. See our /Search/ page for more information. The text of this edition is in the public domain. We have made only a few changes in the text. Contractions such as "do n't" have been rendered as "don't". The little superscript circle designating "degree" for latitude or longitude has been spelled out as "degrees" for those whose browsers cannot render superscripts. Page numbers have been omitted from the table of contents and list of illustrations and indeed the entire text. The text and pictures were originally in black and white; we have made everything blue on white for visual interest on a computer screen, but you may change that either by changing your browser preferences, or by saving the files and editing the source.